Did you have any trouble keeping cool with your air conditioner last summer? Even if you didn’t, maintenance tune-ups simply help them run better and keep you cooler. When an air conditioner doesn’t seem to be cooling you off as it should be, you’re likely tempted to turn your thermostat down lower and lower, but this is only making your cooling system work harder than it should have to, meaning you’re spending more money than you should. 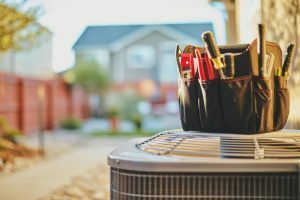 With a well-maintained air conditioner, you can go into summer with the confidence that you probably won’t need to make any emergency repair calls, because it will simply just run better. The buildup of natural wear and tear over the years creates more strain on the components of your air conditioner. One component impacted by this, in particular, is the blower motor. As a result, you’ll see higher energy bills, like in the example above. If your air conditioner has its annual tune-ups, however, then it should retain 95% of its efficiency rating throughout its service life. Speaking of that service life, most air conditioner should last between 10-15 years before requiring replacement. But this is only possible if the system has routine professional maintenance done. Annual tune-ups will help your cooling system give you the best return on investment by lasting as long as possible. Nobody wants to spend extra money each year to have their AC repaired, right? Well, around 85% of the repairs an AC system may need throughout its lifespan are actually preventable, thanks to maintenance inspections that help our pros catch problems early on—which means huge savings in repair bills for you. Ask us about our Priority One Maintenance Program. In addition to the benefits mentioned above, you’ll get preferred service, competent experts at your service, discounts on parts and repairs, no after-hours fees, increased equipment life, worry-free scheduling, and much more. Plus, enrolling in a program puts the onus on us to schedule your services for you so you don’t have to remember to do so each year. See what keeps our customers saying “I Love My Design Comfort!” Contact us when you need service for your air conditioning in Salt Lake City, UT.